The CyberScots buttons were created by John O'Brien. The buttons are $6.50 each. CyberScots members use these buttons to identify one another at Scottie gatherings. 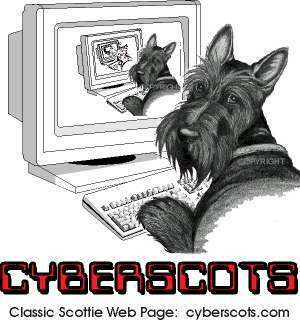 All proceeds from the CyberScots buttons are donated to the Scottish Terrier Club of America Health Trust fund in the form of a memorial contribution. Instead of sending flowers, which soon fade and become a memory, a contribution to the Health Trust Fund will provide a lasting memorial by helping to identify health problems and to support research on health problems which affect our beloved Scottish Terriers. The mission of the Rainbow Bridge Committee is that all contributions will be made to the STCA Health Trust Fund in the name of any Scottie that has gone to the Rainbow Bridge and that an appropriate entry will be made in the STCA Bagpiper memorializing the Scottie's passing. CyberScots Rainbow Bridge Fund, c/o Beryl Gersch, Post Office Box 111, Lansing, IL 60438. Checks should be payable to the order of CyberScots Rainbow Bridge Fund. Please do not send cash. Funds will be placed in a designated savings account to accrue and contributions will be made to the Health Trust Fund on a quarterly basis to coincide with Bagpiper publication dates. We wish to thank the members of CyberScots for their generosity. The first donation to the STCA Health Trust Fund was in the amount of $1,000.00. For more information on The CyberScots Rainbow Bridge Memorial fund, please go to Beryl Gersch's Web Page. From time to time we will present a new fund raiser item. Our newest item is the CyberScots mouse pad with our CyberScot mascot at the computer. We will be donating proceeds from these mousepads to the Scottish Terrier Health Fund. A formal announcement will be made to the CyberScots Group in the near future. Below is a sneak peak at the mouse pad. The artwork has been created by John O'Brien. Josie O'Brien will be taking a pre-order for this mousepad. Thanks for your support.